My picks for the best gift cards for kids plus tips on how to pick out the best gift cards for children. Spoiler alert! Toy stores are at the bottom. Kids love their selfies! 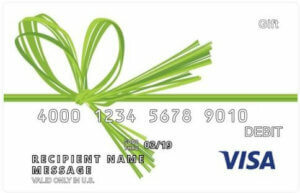 Make a Personalized Visa® Gift Card in minutes. Helping people buy gift cards for kids is one of my favorite things to do. I’m often asked, “What are the best gift cards for kids?” For me, that’s a two-part answer. First, you have to understand the types of gift cards that work well for kids such as cards they can redeem without needing mom to go with them or dollar values that are spendable without chipping in additional money. Once you understand how kids use gift cards, you can easily pick one that meets the criteria. I love this topic so much, I did a study on kids and gift cards last year to find out even more. Below is my list of the 10 Best Gift Cards for Kids and why I think these merchants make the list. Then read below for a more general discussion on kids and gift cards. If you’re not sure what gift card to buy for kids this holiday season, check out the new Happy Cards. Each card is usable at a curated line of stores and restaurants all designed around a particular theme. 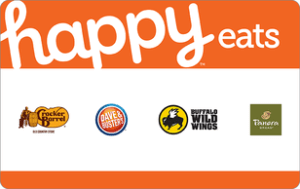 The Happy Kid gift card is usable at Gymboree, Jamba Juice, Rainforest Cafe, Regal Cinemas and Buy Buy Baby. Kids and parents can use this gift card at any one of the locations listed on the card–and the card can be used at more than one. For example, with a Happy Kid gift card, you can use part of the balance to go to the movies and the remainder of the gift card to buy a smoothie afterwards. Meeting all four of the criteria listed below, iTunes and Spotify gift cards can be purchased in spendable dollar amounts, are easily accessible, offer a range of music, movies and apps for a variety of tastes and ages, and mom won’t mind cashing it out if needed. Plus, kids can put these gift cards to work right away, downloading music and games instantly. Gift cards that can be used anywhere are wonderfully convenient because kids can shop locally or online at any place Visa is accepted. 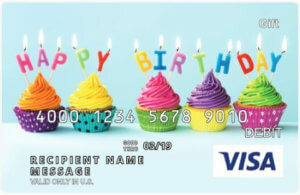 You can even make your own gift card with the child’s image, name, and a special message. I’ve made personalized gift cards for each of my kids, and, even though they spent the money right away, they kept their cards afterwards. Also meeting the criteria below, Target, Walmart, and other large merchants have a variety of products in all price categories and have stores everywhere (including online) so these gift cards are fairly easy for kids to enjoy. They can shop for toys, games, clothes, treats and more. The only reason this gift card isn’t at the top of the list is because of shipping charges. My kids often shop Amazon.com, looking for items precisely within their budget, but get disappointed when shipping charges are tacked on at the end. Then, they to make the hard choice to pay extra for expedited shipping or wait longer for the gift to arrive. If you have a Prime membership that your kids can use, then consider this one of the best gift cards for kids. A gift card to the local theater or a Fandango gift card that can be used at almost any theater is a good choice for kids. I like to put at least $20 on a movie gift card to cover admission plus popcorn. Deliver with a pack of theater candy that the child can enjoy immediately or save for the movie. Kids enjoy buying treats for themselves and may even spring for the rest of the family with this gift card. Low dollar amounts are usable. Just be sure the location is accessible because online isn’t an option and mom may not be inclined to cash out a gift card she doesn’t want either. Same goes for Frozen Yogurt shops. Provided mom is okay with fast food, these gift cards are fun for kids and tweens to receive. My daughter is obsessed with Taco Bell. She received a $20 gift card to Taco Bell, has been there four times, and still has money left on the card. Clothing stores only make the list if you put a usable dollar amount on the card and know where the recipient likes to shop. If you’re not sure about stores like Old Navy or Forever 21, get a gift card to a department store with a variety of brands instead. If you have a sporty guy or gal on your list, then a gift card to Nike, Sports Authority, or a local sporting goods store is a good choice. Don’t underestimate the importance of the amount. My son loves the Nike Elite socks, but a $20 gift card only buys one pair. Shoes are costly and so are the clothes. But kids love these brands so go for it if you put a usable amount on the card. People always ask me why I don’t have toy stores on the very top of the list. The reason is that I have taken my kids shopping with toy store gift cards and it can be an overwhelming experience–we’re talking literally about having a “kid in a candy store.” So if you want to get a toy store gift card, then read my tips on “How to Help Kids Redeem Gift Cards (without the meltdowns! )” before you go. My Rules for Getting Gift Cards for Kids! Kids shouldn’t have to use their own money in order to redeem a gift card. This is true for everybody, but especially true for children who may not have money in their piggy banks. 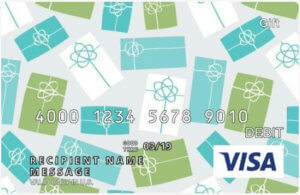 Put a dollar amount on the gift card that can be easily used. If your budget is limited, then get a gift card to a store that offers low-price options. For example, a $10 ice cream store gift card is usable. A $10 clothing store gift card, on the other hand, may be hard to redeem without additional funds. Ideal gift cards for kids can be redeemed within walking distance or a short trip in the car. 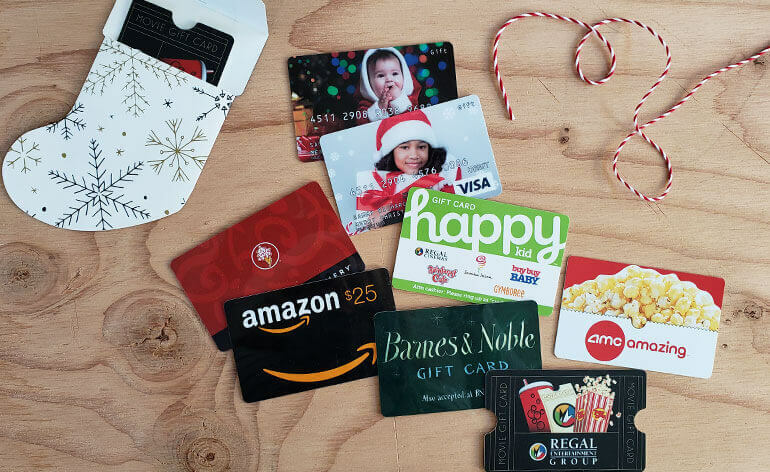 If you’re not sure what stores, restaurants, or movie theaters are located near the recipient, get a gift card that can be used online or a Visa gift card that can be used anywhere. To little people, it seems like so much fun to shop like a big person! The fun can quickly fade, however, if the recipient can’t find something he or she wants to buy. (Read how my kids struggled to use a gift card from Disney.) Adults may be disappointed, but frustrated kid shoppers can get ugly in a hurry. Be sure the gift card you give can be redeemed for a variety of items. Let me also caution you, however, that too many choices can be frustrating as well. That’s why I always suggest making a list before taking kids shopping with gift cards. For kids who need mom to take them shopping in order to redeem a gift card, selecting a merchant that she enjoys will help ensure mom is willing to take the trip and could even give junior a way to liquidate an unwanted gift card. My son, for example, was saving up to buy something on Amazon.com. When he got a Target gift card for his birthday, I bought the gift card from him at face value so he could apply the money towards his savings goal. I have no problem cashing out gift cards that are easy for ME to use. I won’t, however, cash out gift cards to the toy store or game store. The bailout option is a bonus, not a requirement. What Else Do You Need to Know about Kids and Gift Cards? Talking about kids and gift cards is one of my favorite subjects because I have been through so many (good and bad) experiences while shopping with kids and their gift cards. In fact, this subject is one of the reasons I felt inspired to expand Gift Card Girlfriend beyond just presentation ideas. So please ask me about gift cards that are not on this list, make suggestions for gift cards to add and let me know what other questions you have. The gift cards listed above are fairly universal and follow my criteria for the best types of gift cards for kids. You can always get more unique gift cards such as a gift card to the local bowling alley, bounce house place, or cupcake shop. Although local cards are fantastic (and are encouraged! ), they should still fit the rules above for a successful experience–being usable and accessible as a top priority. If you do have questions, let me know in the comments below. I’ll answer your questions as soon as I can.